Globally, 1 in 3 people don’t have access to a clean and safe toilet according to the World Health Organization. This Sunday, on World Toilet Day, we are encouraging people to pause while they flush and consider how the lack of basic sanitation facilities profoundly affects peoples’ lives. Around the globe, one child dies every two minutes from diseases caused by poor water, sanitation and hygiene. Millions of girls miss school every month because they do not have access to adequate sanitation facilities to manage their periods privately and with dignity. Women and girls often have to wait until dark to defecate and urinate, often in secluded spots, exposing them to risk of violence and attack. Kimberly-Clark believes that access to sanitation is an essential for a better life and that toilets change lives. Our Toilets Change Lives program, which launched in the U.K. in 2014, has expanded it to involve more than 15 countries around the world. The program, delivered in partnership with organizations such as UNICEF, WaterAid and Water For People, provides funding and expertise to build, repair and maintain toilet infrastructure, along with hygiene education and behavior change programming. As a global personal care company, we bring decades of experience and expertise in understanding the interconnected issues associated with hygiene, sanitation and water. What we’ve learned from undertaking the Toilets Change Lives program is that no single entity can solve this issue alone; rather it takes, and will continue to take, true collaboration. What has helped us to scale-up the Toilets Change Lives program is the involvement of our consumers, retail partners, NGOs and employees. In India, Kimberly-Clark is working with the Charities Aid Foundation to repair and maintain toilets in schools and mobilize children as change agents to bring hygiene education into their families’ homes. To date, the program has directly benefited over 30,000 school children and teachers across more than 100 schools, increasing enrollments at some schools by up to 40 percent. In Latin America, Kimberly-Clark’s Scott and Suave brands are partnering with Water For People to bring sanitation services, safe drinking water and/or hygiene education to more than 25,000 people across 32 communities and 21 schools in Bolivia and Peru. This year, the partnership has expanded into 3 new markets – Guatemala, Honduras and Nicaragua. We plan to grow this program and involve more people and partners, including our suppliers, as we believe everyone deserves the dignity of a clean and safe toilet. 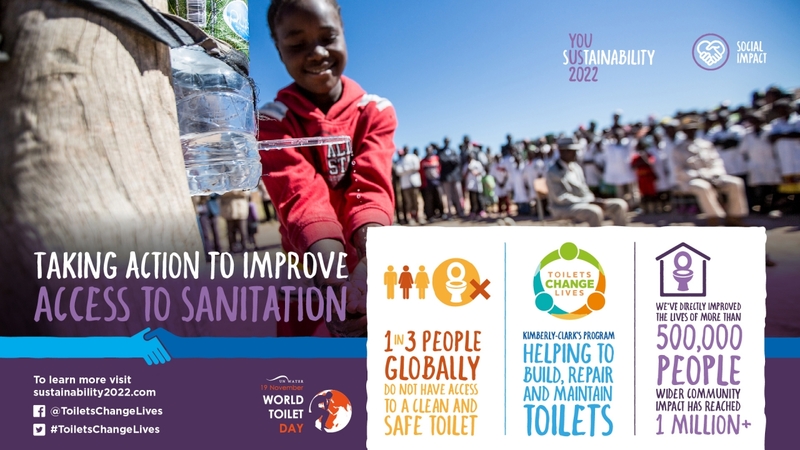 For more information about Kimberly-Clark’s Social Impact goals visit Sustainability2022.com or to learn more about the Toilets Change Lives program visit @ToiletsChangeLives on Facebook.